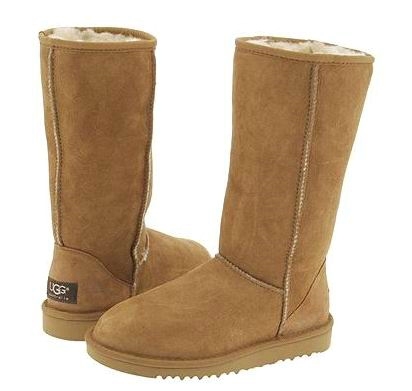 UGG boots are extremely popular. The foreign foot apparel has become a staple item for places that experience cold weather. The suede boots are put to good use in the winter months. Wearers brave the snow in the boots which lauded for both their warming and cooling abilities. They are made from sheepskin and are easy to stain. Mud, dirt, snow and other elements can really ruin the look of the boot. Wearers should already be treating the boots to protect their aesthetics. If you have not tried a water repellent spray for your UGG boots and they got stained from last winter’s wear and tear here are a few ways to clean and protect your boots at home. Take a cloth that you wet with clean, cold water. Moisten the sheepskin on your UGG boots with the cloth. Make sure that you apply the water at the same time so that you prevent lines from appearing on the boot that may be caused by drying. To help soften some of the stains you need a solution that cuts through dirt and grime that was accumulated from wear. Mix Ugg cleaner and conditioner with equal parts water. Soak a clean cloth in the mixture. Apply the mixture to the boots. Pay attention to all stained areas. Make sure they are covered adequately. Allow the cleaning agent to penetrate the sheepskin. Depending on the severity of your stains this step may take longer. You don’t want to rush this part. Then, gently scrub the stained areas with the cloth. After you have scrubbed some of the stains from the surface of your UGG boots, rinse the cloth in clean, cold running water. You may have to repeat this part more than once to remove the staining. This all depends on how much staining has occurred. Then, rinse the cleaning solution off of your UGG boots. Rinse thoroughly so no left over residue from the solution can cause watermarks once the boots are allowed to air dry naturally. You need to reshape your UGG boots. Do this by inserting clean, dry paper towels into each boot. Allow the paper towels to sit inside the boots until they completely air dry. Allow for the appropriate time to lapse. Check to make sure your boots are completely dry. After they are dry take a suede brush to renew the appearance of your boots. Brush the suede in one direction only. This will help soften the appearance of the boots. They’ll look brand new.